The Biological Resource Centre of Institut Pasteur (CRBIP) is pleased to invite you to attend the ECCO meeting 2015 which will be held at the Institut Pasteur in Paris, France from May 27th to 29th. You are all invited to participate in this event, which will bring together the European community of professionals on Microbial Culture Collections, to address the future challenges of Biological Resource Centres, regarding the adaptation to the needs and requirements of academics and bio-industry. 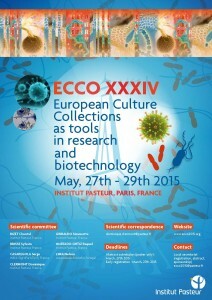 The theme of the ECCO XXXIV is: “European Culture Collections as tools in research and biotechnology”. Save the date and join us in Paris for what promises to be a truly outstanding conference in the field of Culture Collections!